spherical and elliptical MM cartridges with a movable magnet are usually used in the $300 price range turntables. 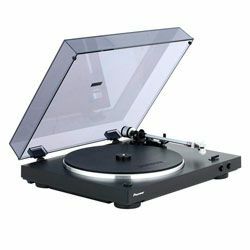 It is necessary to analyze well all the pros and cons of the product when choosing a turntable. Naturally, you will also consider your financial capabilities. 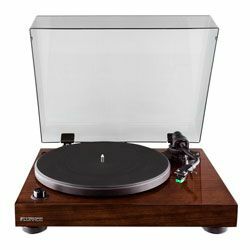 These days it’s quite possible to find the best turntable under 300 for yourself. 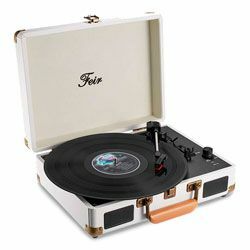 So we have selected six turntables in this price segment, and our article is aimed to show the features, pros, and cons of each one so you could choose the most suitable item! The Japanese brand Denon is widely known for producing premium class equipment. 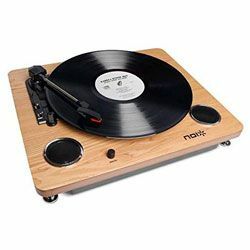 Fortunately, some of their high-class features are present in its best turntables under 300 dollars. The main material of the DP-300F cabinet is metal with a glossy finish. The classic control layout is presented by the start and stop buttons of the engine, as well as the buttons for selecting the speed and diameter of the disc being played. The device is equipped with a fully automatic algorithm for starting and ending playback. It is remarkable that the DP-300F has a non-budget tonearm, equipped with a removable MM head from Audio-Technica. The drive type is direct, with passive torque transmission method. The player has a built-in MM phono equalizer, which can be easily turned off if you want to connect an external one. The sound of the turntable is well balanced and distinguished by its purity, warmth, and accuracy. With the basis of this player, you can build quite a decent entry-level stereo system, due to its high-quality sound and sturdy assembly. The automatic construction makes the turntable so easy to use that you even won’t need to touch a tonearm. The plate is made from aluminum with high precision, ensuring stable rotation, which is extremely important for providing accurate sound reproduction. There is no stroboscope for precise setting of the disk rotation speed, so it is to be hoped that the speed is initially provided by the precision of the rotating parts. You may know Fluance as a Canadian manufacturer of the costly HI-END audio equipment. Their budget turntables have some common features with more expensive ones. 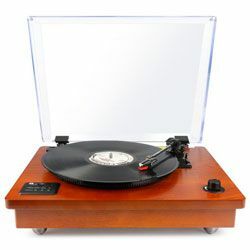 The company made everything possible to update the previous RT80 version not increasing the price, so you can have modernized, warm, solid-sounding record player under 300 dollars. 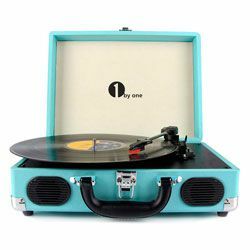 Basically, the RT81 looks like 70s-80s vinyl players. The RT81 has a belt-driven design, built on a massive glossy walnut chassis. DC motor drives a lightweight twelve-inch aluminum disc. 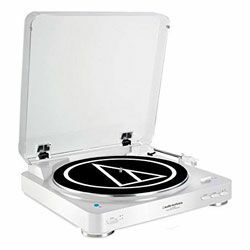 The turntable has the Audio-Technica AT95E magnet cartridge, that is impressive for this price range, which is attached to the S-shaped aluminum tonearm with an advanced anti-roll system that adapts to each plate. 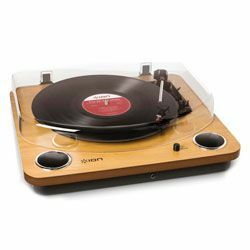 The turntable has both a selectable side-to-side auto-off end, as well as a built-in failsafe phono preamp, gold-plated RCA output jacks, a tinted dust cover, a 45 RPM adapter, and a rubber mat. 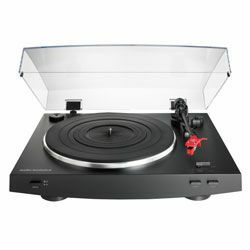 The RT81 is not for professional usage, but it can be a good turntable for newcomers. 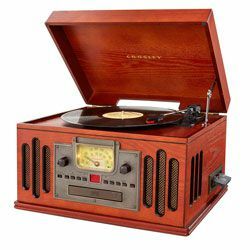 It has everything that a modern vinyl player should have, without unnecessarily complicated additions that only a professional can appreciate. The cabinet of the player is made of a solid MDF, which provides more reliable dispersion of vibrations. 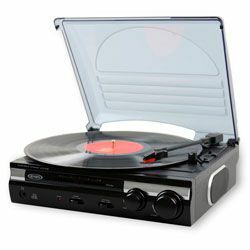 The turntable reproduces both conventional LP and EP vinyl records. The size dimensions of the player (13.8 x 16.5 x 5.5 in) make it portable. The adjustment for the RPM is located on the bottom, making it hard to reach. The Japanese company Audio-Technica has a wide range of audio equipment. The company is known as a manufacturer of the middle and premium segments in the audio market. 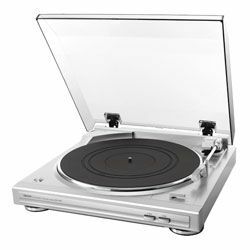 Among all the turntables under 300 dollars, presented by the company, the AT-LP120 is known for highly popular recognition. 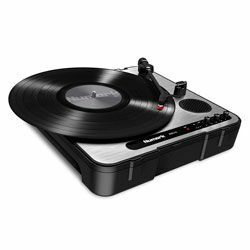 The turntable goes in two colors: black and silver. 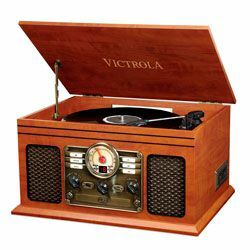 Its angular design evokes associations with the very first vinyl players. The player supports a rotation speed of 78 RPM. 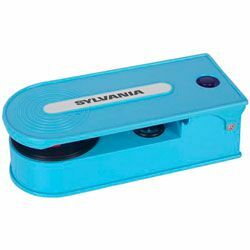 Also, the device has a built-in phono-corrector, thanks to which the spinner can be directly connected to an amplifier or active speakers. S-shaped tonearm has an average effective mass and works well with the vast majority of the pickup heads. 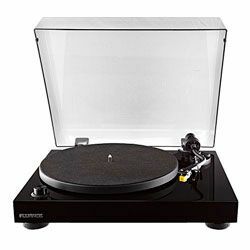 All the other typical features are also included: direct disk drive, quartz speed controller (switchable), smooth rotation speed adjustment within /- 10%, fixed phono cable, convenient height adjustment of the tonearm base and anti-skating system. 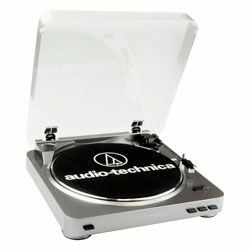 The package also includes the already mounted Audio-Technica AT-95E pickup with elliptical needle sharpening. The model is made in a classic design, but in terms of functionality, it is a strong competitor, especially considering the price category. In fact, there is everything that a beginner fan of vinyl may need. The buyer receives a ready-made plug-n-play solution. The AT-LP120 is able to digitize an analog signal and output a digital stream to a computer via USB, so you won’t need any additional devices. 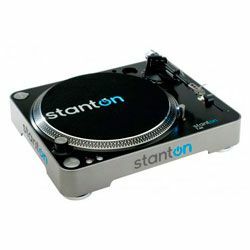 The AT-LP120 comes with a classic felt mat that will be equally comfortable for both DJs and usual music listeners. Direct-drive motor can transfer vibration to the platter. Pro-Ject is a well-known Austrian brand, founded as a budget alternative to other brands that produce analog devices in the Hi-Fi industry. Looking at the Elemental model, you, first of all, pay attention to its non-standard design. Instead of the usual monolithic chassis, there is a “skeletal” design, which proves its effectiveness by reducing the influence of vibrations due to the smaller area of ​​the chassis. One more important feature of the player is its weight – 5.95 lbs. The bulk takes the disk that is made from the artificial stone. The creators were able to implement in this budget model some technologies, previously used in the more expensive Pro-Ject players. For example, Elemental’s standard holder has an MM-type Ortofon OM5E head with an elliptical diamond needle. The Pro-Ject Elemental can be the best $300 turntable for the newbies, as it is equipped with all the necessary components that a newcomer in the vinyl world may need. The Elemental is supplied with a possibility to replace the pickup – this option is usually available only in the premium class turntables. Unlike similar turntables, the position of the Elemental’s tonearm counterweight can be adjusted which may be needed when changing a regular cartridge. Electronic gear shifting is not provided in this turntable. So you will need to manually change from 33.3 to 45 RPM. Pioneer is a legendary international corporation, a manufacturer of the audio electronics. 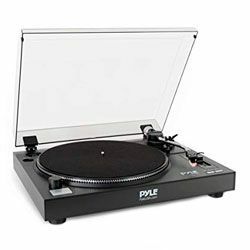 The PL-30-K is a fully automatic vinyl player with a cast aluminum disc, tonearm, and removable head with a high-performance MM pickup. 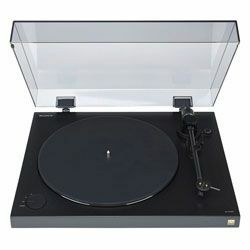 The turntable has a completely black discreet design that will fit into any interior. As protection against any unwanted vibrations, the PL-30-K is equipped with a double-layer chassis with a metal plate at the base. 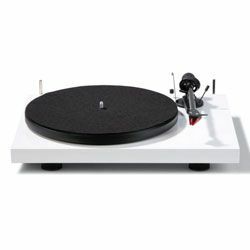 In addition, the table and the tonearm are aluminum, which allows suppressing residual vibrations so they don’t degrade the sound. For the same purpose also serves as a 5mm rubber mat. A unique feature of the model is its built-in phono-corrector. Its signal path uses upscale capacitors. The presence of such phono-corrector allows connecting the PL-30-K directly to almost any amplifier, AV receiver, or music center. However, if necessary, the phono-corrector can be easily disabled. The accurate servo drive with a DC motor smoothly and gently lowers the needle onto the rotating disk, making it easy to use the player. The built-in equalizer-corrector switch allows the user to select the desired mode for connecting an amplifier or for using an external equalizer-corrector. Despite the fact that the PL-30-K is fully automatic, the instruction assumes its setup on a perfectly horizontal surface. Otherwise, installing the needle on a vinyl record may cause failure. The U-Turn is an independent American turntable maker. 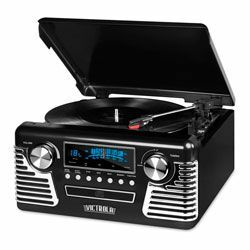 The brand is known for producing high-quality vinyl players for every budget. Out of the box, the Orbit Plus doesn’t require full-fledged installation because the U-Turn did all the hard work at the factory. All you will need to prepare and start the turntable is to place a thick acrylic disk on the turntable spindle, to wrap the attached belt around the disk and the engine (33 1/3 and 45 RPM). The player is available in black, white, red, green or blue, and comes with a transparent plastic dust cover. The turntable kit also includes a pre-installed Grado Black 1 cartridge. The Orbit Plus is 100% manual, so you must insert the needle into the groove at the beginning of the recording and lift it at the end. The player also cannot be connected to analog inputs on amplifiers or receivers. With the help of a phono-preamp, you can play the Orbit Plus through any stereo system or home theater system, bookshelf speakers, or even Bluetooth speakers. The Orbit Plus comes as a fully customizable turntable that you can design for your own specific music needs. The turntable has only “classic audiophile” components, without any nonessentials. The player doesn’t have speed control and auto-return for the tonearm. The design of the belt system is quite poor as the belts lose tension if left on the 45 setting.